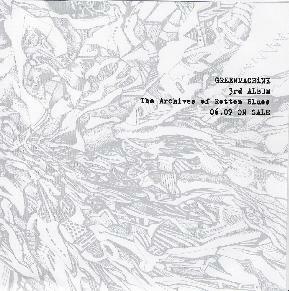 Greenmachine - "The Archives Of Rotten Blues"
I have never heard this Japanese band but this is their fourth release since 1996. This is very fast paced rawly produced nasty heavy punky rock and roll. No blues on this record! The CD features 9 tracks. "Black Summer" and "Punisher" open the CD and are really fast dirty rockers that are totally in your face. "Anima" is the best song on the CD (maybe) and is a bit more melodic at times. The vocals are really the type I can’t listen to much, shouted and screamed and not very clear at all. "Into the Big Sleep (Red Eye Pt 3)" is a very doomy song. I had a hard time getting into this CD. Brutal, punishing stuff at times. For more information you can visit the Diwphalanx Records web site at: http://www.diskunion.co.jp/phalanx.